Internal masonry walls usually need plastering before decorating, though natural stone or brick can be left exposed. Finishing (topcoat) plaster cannot be applied directly to masonry: it requires a “background” of cement-based render, undercoat or bonding plaster. We use the traditional way of covering the walls, plastering is useful for large repairs or when matching existing plastered walls. It can be also cost-effective than buying large quantities of plasterboard. Covering a whole room? Then consider dry lining, whereby plasterboard itself is used as the decorative surface and we fill the joints between boards with jointing compound and smooth sanding after. Bonding coat is an undercoat plaster that we use for nun-porous background and, patching old masonry, engineering bricks or patching old laths, but not before applying a consistent coat of PVA to the surface. 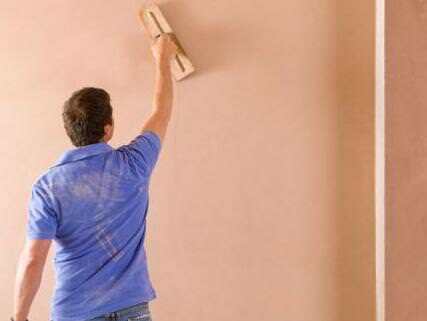 Undercoat plaster we use it for semi-porous background such as bricks and building blocks and as a complete base coat for finishing plaster. The render, a mix of sand and cement, we use it for internal masonry as an alternative to undercoat plaster, despite the fact that is difficult to apply, we use it when waterproofing is necessary, mixed with additives that increase this capability. We use the one-coat plaster to internal walls and ceilings, over the undercoat plaster or plasterboards. The finishing plaster is the topcoat plaster that we use it to form the final surface to be decorated. We usually apply 2 coat of 2mm to achieve the best finish. Lime plaster is the most common wall plaster covering before the advent of gypsum-based plaster. We use it for repairs in period properties as the lime plaster allows the wall to “breath” more than a gypsum-based plaster. We also use textured coating, which is not a plaster in the traditional sense, but has similarities in that it is a commonly used ceiling and occasionally wall covering. We use it as a topcoat in a such way that it creates textures rather than a smooth finish. The decorative plaster is the top professional finish plaster, made from ground marble, it provides a matt, coloured finish which ends with a polish.